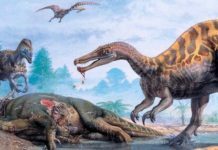 The Devonian Period is a period of time on the geological time scale which started about 419 million years ago and ended approximately 360 million years ago. This time period was given this name because it was named after the area in which rocks from this period were studied: Devon, England. 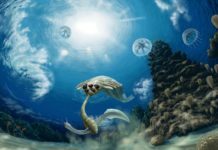 Scientists believe that during this period of time, there was a significant amount of evolutionary activity occurring on dry land for the first time. During the Silurian Period, life had colonized the land but did so mainly along the shores. It wasn’t until this period that the first “deep” land colonization happened. Before this significant colonization of the land, the soils of Earth were red – indicating a high mineral content but no organic accumulation. A soil that was only inhabited by algal or bacterial layers. This would change during this period as terrestrial vegetation began to take hold and spread. The early plants, however, were nothing like most of the plants we are familiar with today. They had no root or leaf system, and many of them didn’t even have a vascular system (although certainly, some did). The animal life that existed along these primitive plants mainly belonged to the arthropod family. There were trigonatarbids, myriapods, mites and wingless insects. Most certainly there were also additional types of fauna but they have most likely been lost to time. By the end of this period, the first true plants had begun to literally take root. These were plants that had root and leaves systems and most of them also had vascular systems. This was also the time when seed plants began to appear. And all through this period life began to diversify and multiple. 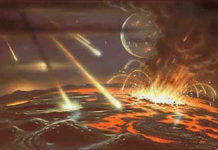 This has prompted many paleontologists to name this increase expansion of life the Devonian Explosion. While not as popularized as the Cambrian Explosion, it is as important as it. 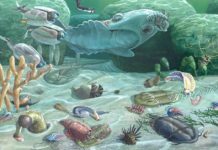 While life was gaining a foothold on land, the seas of the Devonian Period were beginning to diversify their numbers. In the early part of the period, the seas were dominated by jaw-less and armored fish. Then by the middle of the period, the first jawed fish appeared. And many of them would continue to evolve into some of the fiercest predators the Earth has ever known. 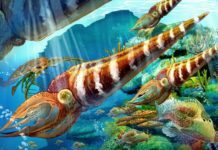 Other marine animals included spiriferids, tabulate corals and rugose corals, blastoid echinoderms, bivalves, graptolites and of course, trilobites. The climate during this period was fairly warm and scientists doubt that the Earth had any glaciers. Along the equator, the weather was the driest but all over the globe it was pretty dry. During the first part of this period, the ambient temperature is believed to have been around 30 degrees Celsius (86 degrees Fahrenheit). However, as this period wore on, CO2 levels began to drop and as a result, the Earth cooled slightly: about 5 degrees Celsius (9 degrees Fahrenheit). This didn’t last long though and by the end of this period, temperatures were as high as they had been at the beginning of this period. Many paleotologists believe this warming led to the eventual extinction of the stromatoporoids. Stromatoporoids weren’t the only animals to go extinct, however. Most of the jaw-less fish known as agnathan died out, except for a subclass called heterostraci. 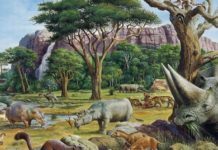 At the end of the Devonian Period, another extinction occurred – which many scientist rank as one of the Five Major Extinction Events to hit the Earth. Some of the animal groups affected, besides jawless fish, were trilobites, acritarchs, placoderms, ammonites and brachiopods. As of this writing, scientists still aren’t sure what caused this extinction event that closed out this period.